In the central north of or mystery country, a collection of monasteries perch 1,000 feet above the Plain of Thessaly at the top of titanic natural pillars. This is Meteora, first inhabited by Christian hermits seeking solitude and security in the 11th century. These first settlers scaled the towers and lived in caves and cracks in the stone. In the 13th century, groups of monks came to the area and began to build. Over the next several hundred years over 20 monasteries were built. Today, six of the surviving monasteries are open to visitors. 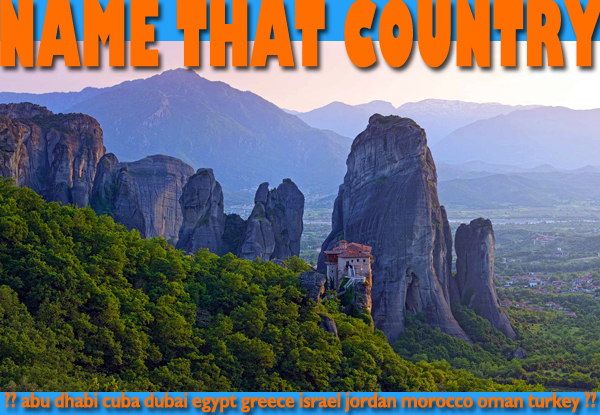 This entry was posted in Greece, name that country quiz and tagged Greece, greece tours, Meteora by yalla2013. Bookmark the permalink.